Steve Jobs once said ‘if you see a stylus, they blew it’, but I think that Samsung might have something to say about that. Their Galaxy Note range of devices have been hugely popular, and there’s no reason to suspect that the Galaxy Note 3 would be any different. We know that Samsung are going to unveil the Note 3 at IFA on September 4, but we don’t really know what the device will look like (other than that it will probably be made of plastic). ETrade Supply, a distributor of OEM parts, has listed the digitiser assembly for the Galaxy Note 3 on its website, complete with pictures. 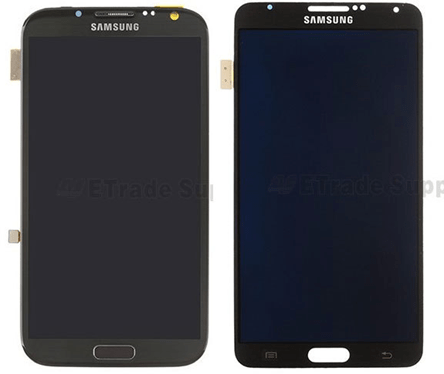 The left image above is last year’s Galaxy Note II and on the right is what ETrade are claiming is the Note 3. You’ll note (pun intended) that the Note 3 is larger (said to be 5.68 inches), squarer and has a lot less bezel space than its predecessor. Interestingly, the capacitive buttons are lighter and thus more obvious without having to be lit up. The face has the same grey, faux-metal texture of the Galaxy S 4. No specifications are given, and the part is listed as ‘out of stock’, but we’ll soon see whether or not their leak is accurate. Previous Samsung unveils Galaxy Tab Kids… for kids! It’s slightly bigger. The screen on the Note 2 was 5.55-inches; Note 3 is said to be 5.68. Its supposedly going to be a similar upgrade like the s4 was to the s3. similar sized body larger screen. the difference in overall dimensions will be a few mm at most. I think that every time Samsung successfully proves Steve Jobs wrong, he looks more and more like a PR-created ‘icon’ than the so-called ‘genius’ we were all led to believe. To me personally, the true geniuses of the modern computing world were Jay Miner, Dave Haynie and Carl Sassenrath. Where Steve Jobs stole/copied. The true IT heroes created! P.s. I called Optus about preordering a Note 3. No luck, was like talking to someone whos script came from a “choose your own adventure” book. Steve Wozniak was the true genius behind Apple. Jobs was just a marketing man.